Maajid Nawaz is a British-born muslim and former Islamist who spent four years in an Egyptian jail. Ayaan Hirsi Ali is a Somali-born atheist and former Muslim who fled to America from the Netherlands when her collaborator on a film critical of Islam was murdered. Their views on Islam differ, but both campaign for reforms within the religion itself and to its relationship with the wider world. They met in London last night to discuss their work, points of agreement, and how progress might be achieved. Christy Cooney went along. Readers of London’s Independent might have noted the following sentence when it appeared in the paper’s editorial in the days before last year’s general election: “…we belong to no party or faction, act without fear or favour, and know our readers are wise enough to make up their own minds.” Note that middle clause, and recall that the paper’s editor had admitted just four months earlier to having declined to reproduce the Charlie Hebdo cartoons for fear of violent reprisal. Who was the paper now claiming not to fear? David Cameron? Ed Miliband? I wouldn’t single out the Indy for declining to act unilaterally but for its self-satisfaction, both in this example and at the time of the attacks, when it patted itself on the back for putting a middle finger on its front page. If on these occasions the press is going to leave the actual defenders of free expression to act as lighting rods for Islamist vengeance it might at least not pretend to have done otherwise. I thought about the editors of our national newspapers last night as I identified JW3, Finchley Road’s beautiful Jewish community centre, by the police uniforms stood at its gate. They were there to ensure the right of I and the rest of the sold-out crowd to hear converse two people whose work really does endanger them, but who decline any refuge in cowardice: Maajid Nawaz and Ayaan Hirsi Ali. The two have differing views on Islam—Nawaz advocates alternatives to extremist narratives and reform within Islam, while Ali excoriates the doctrine of Islam itself—so the conversation began on the topic of how the dialogue came about. Nawaz has recently published a written collaboration with prominent non-believer Sam Harris and points out that, for those of us interested in conversations of this sort, the dividing line is no longer between the religious and the so-called New Atheists—that debate is to some extent academic. The divide is now between those who are willing to defend secular, liberal democracy and condemn its enemies in absolute terms, and those who are not. They touch on the lesser absurdities of the latter group: Nawaz sips a coffee in honour of the Guardian interviewer who used his choice of a skinny flat white to question his credentials. And then on the greater ones: Ali has been told that she cannot speak about the problems within Islam because her view has been skewed by a difficult childhood, never mind the impact Islam had on that childhood. She laments those who will not mention the name of Muhammad while discussing the problem of Islamism, comparing the habit to talking about communism without mentioning Marx or national socialism without mentioning Hitler. It is amazing how many on the left will not concede this point, not least because, as the evening demonstrated, what one says about Muhammad once it has been conceded is an entirely different question. There were some positive takeaways from the conversation: education and dialogue must be the priority; institutions will be slow to change but they will change in response to grassroots movements; outlawing non-violent extremism won’t solve the problem of Islamism. Incidentally, can anyone think of a problem that education and free expression couldn’t solve? Or one that ignorance and censorship could? I would love to speculate that it was in this spirit of pluralism that the venue was chosen, and I’m sure that was part of it. But the sad fact is that synagogues and Jewish centres often come with high railings (and in this case a dry moat) already installed. For all its positives, the evening was a reminder that we live under a de facto blasphemy law, and that Nawaz and Ali are rare in their willingness to risk their lives to live outside it. All such laws have, however, a single redeeming feature: they evaporate the moment they are broken. This one could not survive a show of solidarity like #JeSuisCharlie if the sentiment were sincere and lasted more than a few days. Ali in particular has long been the hostage of our cowardice, and productive dialogue like last night’s between brave, intelligent people will help bring about her release and that of all those like her. 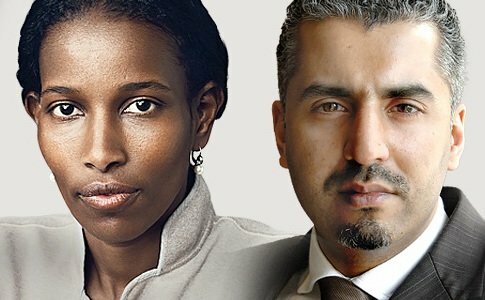 Maajid Nawaz and Ayaan Hirsi Ali have differing views on Islam, but both campaign for reforms within the religion itself and to its relationship with the wider world. The divide is now between those who are willing to defend secular, liberal democracy and condemn its enemies in absolute terms, and those who are not. The de facto blasphemy law under which we live could not survive a show of solidarity like #JeSuisCharlie if the sentiment were sincere and lasted more than a few days.